For over half a century, the San Diego County Water Authority has imported water to meet the San Diego region's needs through times of drought, economic expansion, and population growth. Through much of the its history, the Water Authority has concentrated on importing water and maintaining the regional pipeline system. The Water Authority joined the Metropolitan Water District of Southern California in late 1946 to gain a connection from the Colorado River. Water from the river reached San Vicente Reservoir near Lakeside a year later, via San Diego Pipeline 1 and the Colorado River Aqueduct. The county still relies on Colorado River water today. In addition, the Water Authority works through MWD to import water from Northern California rivers via the State Water Project. The Sacramento-San Joaquin Bay-Delta is the hub of the State Water Project, and numerous efforts have been made in recent years to address the Bay-Delta's complex environmental and water supply challenges. The region's reliance on imported water is not surprising, given its semi-arid climate and periodic droughts. 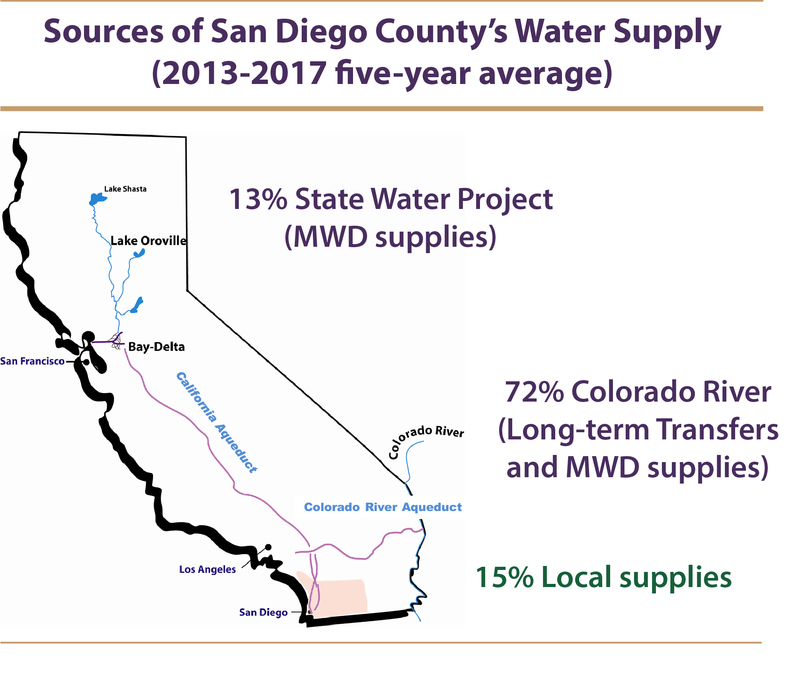 The Water Authority recognizes that San Diego County must diversify its water supplies, therefore decreasing the percentage of imported water in the region's total supply mix. The Water Authority’s water supply portfolio includes a suite of relatively new supplies from the Colorado River. These supplies include a water conservation and transfer agreement with the Imperial Irrigation District and water conserved by two projects, the All American Canal Lining Project, and the Coachella Canal Lining Project. In addition, to help ensure adequate water supplies for the region, the Water Authority pursues short-term dry-year water transfers to help offset the impacts of potential water shortages caused by general drought conditions or restrictions on State Water Project deliveries. The Water Authority continues to actively locate, evaluate, and develop new water sources that will help meet the county's needs, while striving to protect and enhance sensitive ecosystems during construction and maintenance of vital water supply projects.